3rd November 2017 – Move over Halloween, it’s Holloween time! 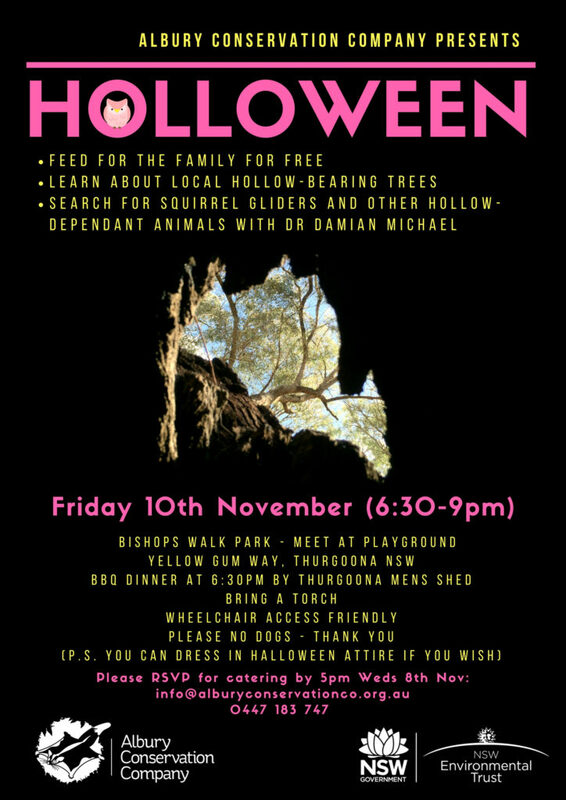 Happening Friday 10th November, this twighlight community event in Thurgoona offers locals a FREE BBQ, and a chance to learn about our local hollow-bearing tree mapping project, and to search for Squirrel Gliders and other hollow-dependent wildlife with wildlife expert Dr Damian Michael. The BBQ kicks of at 6:30 and is being run by our good friends Thurgoona Men’s Shed. This is a family-friendly event, and has good wheelchair access. Please no dogs. Bring a torch as we will be finishing in the dark. Please RSVP by 5pm Weds 8th November (for catering purposes) – to [email protected] or 0447 183 747. Everyone is welcome!